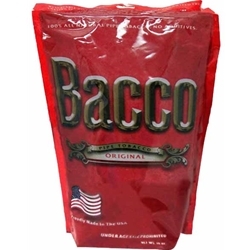 Bacco Original Pipe Tobacco, features the world’s finest tobacco, the Kentucky Burley leaf. Stringently selected, and blended together at the right temperature, with flavors and ingredients that are hard to match. The ultimate results, a satisfying smoke each and every time! Available in: 16 oz. (450g) (1 pound) pouch.